This picture is from our new hound video "Southwestern Bear Adventures" just released. See 13 bears treed and 4 on camera kills. Click video link above for information. The southwest is home to a thriving population of American Black Bear. 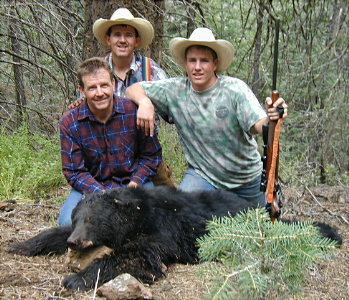 We hunt Eastern Arizona and Western New Mexico in the Apache-Sitgreaves and Gila Nation Forests. The bear density is very high in both areas. 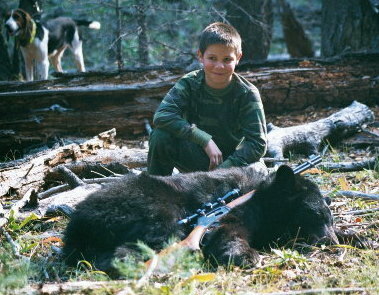 Harvest hunts are for trophy bears using the finest bear hounds. In the pre-dawn hours hounds are loaded and we head out "rigging for bear". Our rig dogs can smell a track form the truck and they sound off when the scent is located. Turning the hounds loose commits us to the whim of the bear. He may be close and tree only a mile away. He may go further, through canyon and over high mountain peaks. The hounds bawl will tell us the way. When your bear is treed there is ample opportunity for trophy evaluation, pictures and video. We encourage the harvest of mature animals with good pelts. Over 65% of our bears are blonde to cinnamon in color. We have three master houndsmen to pair you with. These dogs are hunted year around and tree more bears than we have hunters for each year. Drew Herrick tagged this bear. He brought his dad along as well. At 12 this was Drew's 1st big game animal. Steve & Evan Ault (front) on a father/son hunt with us. Rocky Adair in background. Steve says,"No one on God's green Earth has more fun than we do."